Night time Nasal congestion can have a dramatic affect on the way you sleep and the way you feel through out the day. If you suffer from stuffiness or nasal congestion due to allergies, cold or a deviated septum there are drug-free solutions that really do work to help you breathe and sleep better. Here are two drug-free products that we found that work to help you get a more restful sleep. SleepRight® Nasal Breathe Aids gently open your nasal passages to increase airflow and help to reduce snoring by gently expanding your nasal passages, significantly increasing airflow. Available in two sizes small/medium or large each box includes 3 SleepRight® Nasal Breathe Aids and one storage case, each breathe aid should last 15-days. 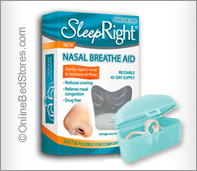 SleepRight® Nasal Breathe Aids are adhesive free, Click the ” Shop Now” button to learn more. Relieve night time nasal congestion. Breathe Right’s patented reflex technology gently lifts your nasal passages allowing you to breathe easier. Breathe Right nasal strips placed correctly across the nose will help you to get fast, effective nasal congestion relief. 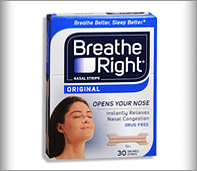 All Breathe Right nasal strips are drug-free, available in original tan, clear, mentholated, kids, extra and New! Advanced.